Do you ever wonder why your propane tank gauge never shows more than 80% full, even after a refill? There is a reason for that, and it requires just a simple scientific explanation. When it comes to heating fuels in Burlington, propane has some unique properties that set it apart from other fuels. Read on to learn why your tank should never be filled to 100%. The entire explanation revolves around this one fact: propane expands with heat. This is true of most substances, but with propane, there is an extra factor to consider. You probably know that water expands some when heated. Apply the same amount of heat to propane, which is also a liquid, and its volume increases 17 percent more than water. So what does this mean for your propane tank? 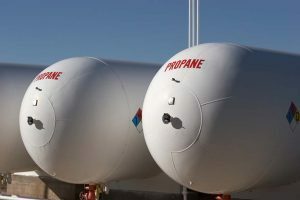 Propane suppliers know they must leave space in the tank for propane to expand. Overfilling the tank could lead to problems when the propane expands, such as leaks or even explosions. By federal regulation, every tank must be installed with an OPD (over pressure device) to alert the user if the pressure inside the tank reaches a dangerous level. If your propane tank is buried underground it is partially insulated from the heat. Due to this fact, your underground tank may be filled a bit over the typical 80%. Don’t worry, there is no cause for alarm in this case. No matter the size of your tank, it is still safer for it to be filled to no more than 80%, even a small cylinder such as the ones typically used for backyard grilling. In fact, a tank used for a backyard grill is more likely to come in contact with extreme heat from the grill itself and the outside heat, so the risk for expansion is greater. Use this chart to determine what 80% in gallons would be for your tank size. Make sure your tank is not negligently overfilled. If you currently (or plan to) heat your home, cook your food, or run any of your other household appliances with propane, consider making Alamance Oil your regular supplier. Alamance Oil abides by the 80% fill rule with every refill to keep you and your family safe. You can count on quality and consistency when it comes to your tank and heating fuels in Burlington when you choose Alamance Oil as your supplier. You don’t have to worry that you’re not getting the full amount of fuel for your money, as you will only be charged for the number of gallons your tank receives in a delivery. Regular deliveries ensure you will never run out of propane. Call Alamance Oil today: (336) 623-9741.